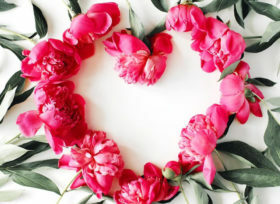 This year's Valentine's Day is very special for My Peony Society. You probably know that we try to make sure that peonies are available as long as possible. We do everything we can to extend the peony season. And now, for the first year ever, we are able to deliver fresh peonies on this lovely day! Red is, without doubt, the most romantic colour. It signifies love, intensity and passion like no other colour. That’s why are very proud to be able to say that Henry Bockstoce is already available early this year! Its deep red colour and big yet elegant shape never fails to impress! Isn’t that the perfect gift for Valentine’s day? The huge spike in the demand for red peonies on Valentine’s Day drives up the price, so order your peonies early!